Winter is here and it’s time to go skiing! Like many couples, my husband and I all but stopped skiing while our kids were little. Last Winter, we decided the time was right to start skiing as a family and we introduced our boys, James, age 7 and Jonathan, age 5, to the sport at a small, local mountain. Happily for us, they took to skiing at once and we immediately decided to plan a longer family ski trip to a large resort. We live in close proximity to all the NYC-metro airports and I strongly considered booking our posh brood for a trip to Vail, Deer Valley or Aspen. 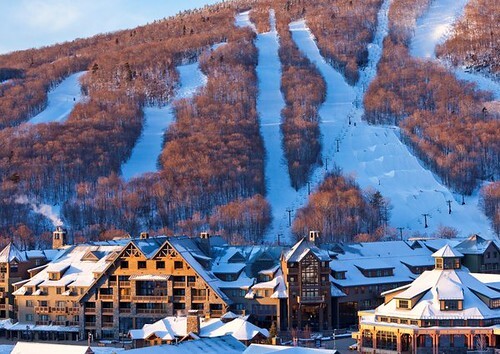 However, I was a little intimidated by packing so much gear for a cross country flight (or even arranging for it to ship in advance of our trip) so I was all ears when a friend told me about the Stowe Mountain Lodge. Unbeknownst to me while we were taking our break from skiing over the last few years, a sprawling, luxury, slope-side ski resort – West Coast style – had been developed only several hours drive away in scenic Stowe, Vermont. Skiing in the Northeast no longer meant renting a shabby, tired condominium and fighting for seats on a crowded shuttle bus headed to the slopes…instead, we could stay slope-side, immediately adjacent to an acclaimed ski school at a beautiful, charming resort with an award winning spa, great food and a ski valet. Yes, a ski valet. The importance of this last amenity simply can’t be overstated. Here’s how it worked – upon our arrival at the resort, the ski valet staffers whisked away our ski gear and arranged for our skis and boots to be waiting for us each morning – boots inside and skis slope-side. Apres-ski, these same magicians collected our skis outside (there was no need for us to carry anything) and treated our boots to a magical process that left them, and any assorted mittens, gloves, gators and scarves dry and toasty for the next day’s adventures. Or, to put it more simply, I never had to carry my brood’s skis anywhere – not to our room, not from the car, not inside to be stored, not at all. Could any parent dream up something so wonderful? 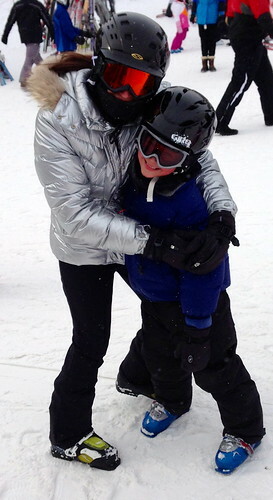 It was all the fun of skiing with none of the schlepping! The Stowe Mountain Lodge sprawls at the bottom of Spruce Mountain, next to the main ski lodge and ski school at Stowe. 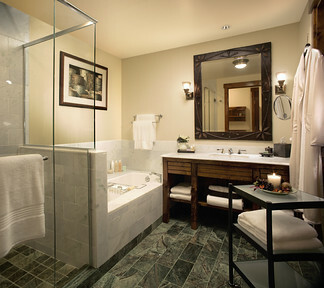 The hotel itself is designed in the style of a grand Adirondack lodge. There’s a beautiful lobby bar with a soaring stone fireplace and multiple comfortable seating options for relaxing with a drink including deep leather sofas, armchairs and rocking chairs. There’s a piano as well as several other smaller fireplaces tucked in various corners of the space. Thanks to the design, the large space feels intimate and welcoming. It is entirely child friendly. Apres-ski there is a bar set up next to the fireplace serving hot drinks (cider, hot chocolate, etc. all available spiked) and servers are happy to take orders for food and drinks from the adjacent Hourglass Bar. Just above the lobby the Hourglass Bar serves excellent craft cocktails, microbrew beers and a nice selection of smaller plates ranging from cheese fondue to salads to lobster mac & cheese. There is a wonderful kids menu and the bartenders make a mean Shirley Temple. The Solstice restaurant is more formal, offering farm to table artisanal foods for dinner. A grand buffet breakfast is served there each morning. 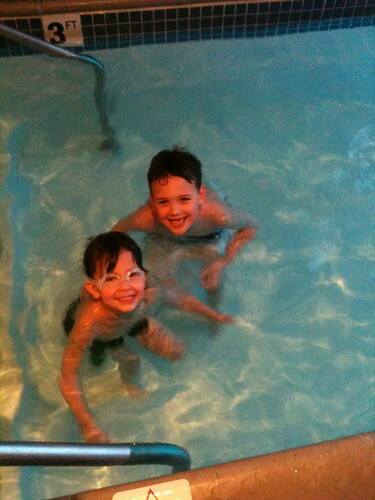 There is a large, heated outdoor pool and two outdoor hot tubs. The pool was designed to be accessed from inside so that guests can easily enter and leave without having to brave too much of the cold Vermont air. Surrounding the pool are hooks and benches to stow clothing and robes and there are lots of clean, folded towels, even when the pool is at its busiest. Just across from the stairway that leads to the pool is an enormous spa. The spa offers beautiful locker rooms, a sauna, steam room and Jacuzzi and a gorgeous co-ed relaxation room with stunning views and ultra-comfortable lounge areas. The relaxation room alone is reason to visit the spa. I enjoyed a fabulous massage while the kids were in ski school next day. Some spas are an afterthought…this one is a true destination spa. Don’t miss it! We booked a Timberline Studio room which had a King size bed, a sofa that pulled out into a bed for two, a small kitchen and naturally, a great view of the mountains. My favorite feature of the room was the over-sized bathroom with separate deep soaking tub, double vanities and a separate bathroom within the bathroom. There was a large flat screen TV, several phones, a safe and nice bath amenities. My only complaint was the lack of closet space. There was one large armoire and several chests of drawers but given all of ski clothes, it would have been helpful to have a large coat closet and additional hanging space. Overall, the room was well designed and stylishly decorated with modern print fabrics. Housekeeping did a nice job tidying up twice a day. The studios are all a similar size – approximately 550 square feet – and were perfectly sized for a family of four. There are smaller hotel rooms available as well as junior one bedroom and full one and two bedroom suites. The larger suites boast their own in room washer/dryer which would be a big help during a longer stay. The hotel is dog friendly so feel free to bring a beloved family pet along with you for the stay. Due to the size of the hotel, there can be a sizable walk from your room to the elevator and from the elevator to the lobby. Our kids thought the walk was terrific but if you have very young children, you may want to request a room closer to the elevator. As our room was located on the top floor, our room had soaring ceilings which added considerably to the ambiance. Be sure to request the top floor if available! The skiing at Stowe was simply fantastic. We were fortunate to find great conditions for the most part with little to no ice. Our last two days were quite chilly but thanks to the Gondola ride up Mt. Mansfield, we were still able to ski most of the day. Stowe is famous for the highest vertical drop in the East and its many double black diamond trails. We were happy to discover an extraordinary number of groomed intermediate trails as well, many of which rival those out west in terms of sheer length. On the Spruce Mountain side of Stowe – adjacent to the resort - there is a terrific selection of green trails – perfect for kids and beginners of all ages, as well as additional intermediate terrain. For more advanced or adventurous skiers, there are multiple terrain parks, large ski jumps and obstacle courses. Although the resort was very crowded there were little to no lines at many lifts. The Gondola line was the longest but it moved quickly and was very well organized. Instead of traditional lift tickets, each skier purchases a “Stowe Revolution Card”, an electronic lift ticket which is programmed remotely. Added bonus – there is no need to clutter up your fancy ski jacket with a clunky paper lift ticket. We enrolled both boys in the full day ski school for four days. The full day program runs from 9:30am – 3:30pm at the Adventure Center. The Adventure Center is located steps away from the ski valet at the Lodge. It is a sweet building with a large check in area up front, a play area in back and a large lunch room for all the kids in between. Right after drop off the staff observes the kids on skis to ensure they are placed in the correct skills group (Snowflake, Raccoon, Fox, etc. for the 4 – 6 year olds and Level 1, 2, 3, 4, etc. for the older kids). 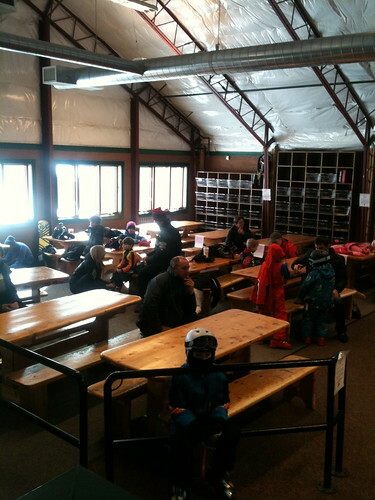 The kids ski in small groups taking two hot chocolate breaks and one lunch break. All breaks are taken at the Adventure Lodge, not in the main lodge, i.e. the kids spend all day with other children, not mingling with adults in the main lodge. Children are offered an array of choices for lunch and the staff was very careful to ask about any allergies. As the older kids advance in skill, their teacher can opt to take the gondola to the Mt. Mansfield base and ski on the other side of Stowe, in which case they will take breaks outside the Adventure Center. The ski school was extremely busy because of the holiday weekend but the staff was super organized and everything ran smoothly. Each parent receives a specific drop off ticket at registration and only an adult with the ticket can pick up your child. It felt very safe and I was comfortable leaving the boys there. 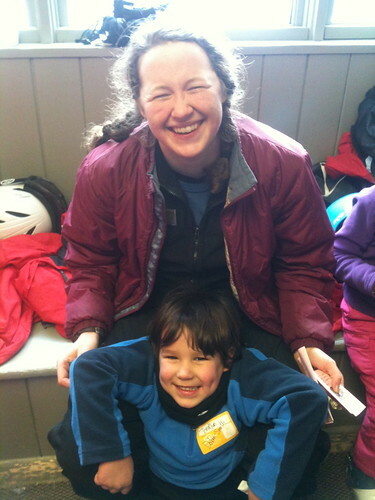 Older children are dropped off and picked up outside on the lift side of the Adventure Center building directly with their instructors. At the end of the lesson, parents receive a short but detailed written report updating their child’s progress and ski level. Our boys improved their skiing dramatically while at Stowe. When we left home, they were at best comfortable skiing on the bunny slope at our local mountain. Upon our return, they were happy skiing all the groomed black diamonds! Stowe boasts a number of wonderful eateries right on the mountain. There are several restaurants located at the top of various lifts (and the Gondala) showcasing amazing views of the mountains and even a few stands where you can quickly pickup a Belgian Waffle. These are great spots to simply enjoy a hot chocolate and take a rest with friends. The main ski lodge at Spruce Mountain resembles the great hall of a turn of the century Adirondack great camp. It’s gorgeous! Even the bathrooms are lovely and immaculately clean - they more closely resemble the bathrooms you would find at a Ritz Carlton than those of a typical ski lodge. The lodge offers a variety of food stations with every food option imaginable from fresh salads to sushi to various chilies to gourmet entrees. As guests of the Stowe Mountain Lodge we were able to charge food from all the restaurants directly to our room. So convenient! There is also a cozy bar with live music and generally one or two kids activities – face painting, temporary tattooing – going on throughout the day. We had a great experience at all of the hotel restaurants. The kids particularly loved the “kids buffet” at Solstice each night. While we were at the hotel there was a game room set up in the conference center area with arcade games and air hockey. There were also kids movie nights as well as Laser Tag and a “build-a-bear” activity. In other words, there was a lot to do. 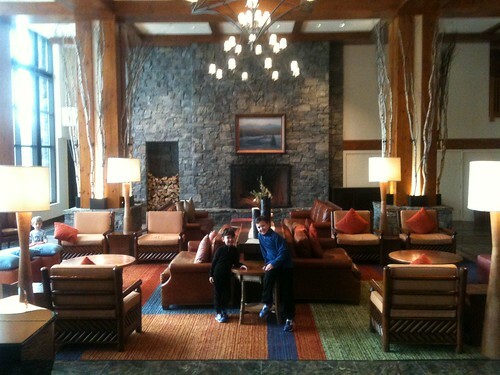 Our favorite activity was simply lounging around in the lobby around the fireplace. The village of Stowe itself is several miles away from the resort. We didn’t make it there for dinner at all but we heard rave reviews about a number of restaurants and the general charm of the village. There are several other luxury hotels nearby including the Trapp Family Lodge (owned by the Von Trapp Family from the Sound of Music) and the Topknotch Resort, all of which have their own lovely restaurants. Our entire experience from the resort itself to the skiing to the food to the ski school instruction was absolutely first class. Most importantly, the Resort and the Mountain were very family friendly. Our advice is to skip the long plane flight and take the easy drive up to Stowe, Vermont for the same experience without all the travel. Our posh brood has already planning a return trip for this year! About The Author: Danielle Dobin is a Westport, CT-based wife and mom of two, founder & president of Apifeni, the luxury lifestyle and activewear brand for women and is a regular contributor to Forbes Magazine.